In my case, this was mostly happening in public spaces like hotels, airports and malls; when one day it started happening at home which is simply not acceptable! I have struggled with it for quite some time, searching in forums where nobody seems to know what they are talking about. Some claim that this is an iOS feature in order not to drain battery but what about our notifications while the screen is off?! Below is a temporary solution that I found in some forums which works for many, including me, and solves the problem temporarily. For me, it was working fine for about a day or so before facing the same problems. Turn Wi-Fi on. If your iOS device supports mobile data, turn it off for now. Turn off the device (by keeping the sleep button pressed and then swiping). After the home screen loads, reset it (hold the home and sleep buttons down and keep holding until you see the apple logo). If this is happening at home, or you are the administrator of the network, then you are in luck! Most routers have a feature to specify how long the router should keep IPs attached to devices before releasing them. 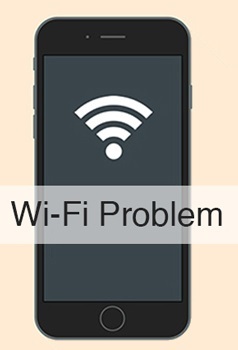 This setting in public spaces is very small due to the large amount of devices connecting to the network and the limited amount of free IPs. Simply increase the value on your DHCP device (usually the router) as per below screenshot and voila!